The Dunrobin Community Association defines the community boundaries as Murphy Sideroad, Constance Lake Road and Berry Sideroad on the south, the Ottawa River to the east, a line following Limestone Road to Kinburn Sideroad to Stonecrest Road to Thomas A. Dolan Parkway to Marchhurst Road, and on the north by a line following Kilmaurs Sideroad to Woodkilton Road to Kinburn Sideroad to Constance Creek on the north. Here’s an infographic that describes the neighbourhood as a Village of 100 (2011 data). Dunrobin took its name from Dunrobin Castle near Inverness, Scotland and was settled in the 19th century at the corner of Dunrobin Road and Thomas A. Dolan Parkway. 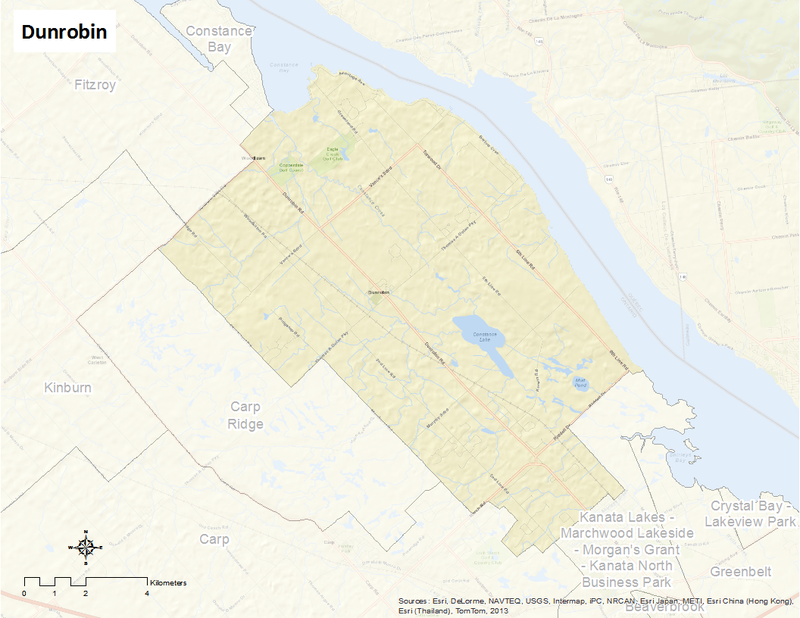 While originally started as an agricultural community it now serves mostly as a focal point within a larger community that has a mixed population of farmers, commuters who work in Kanata and Ottawa-Gatineau, cottagers and retirees.